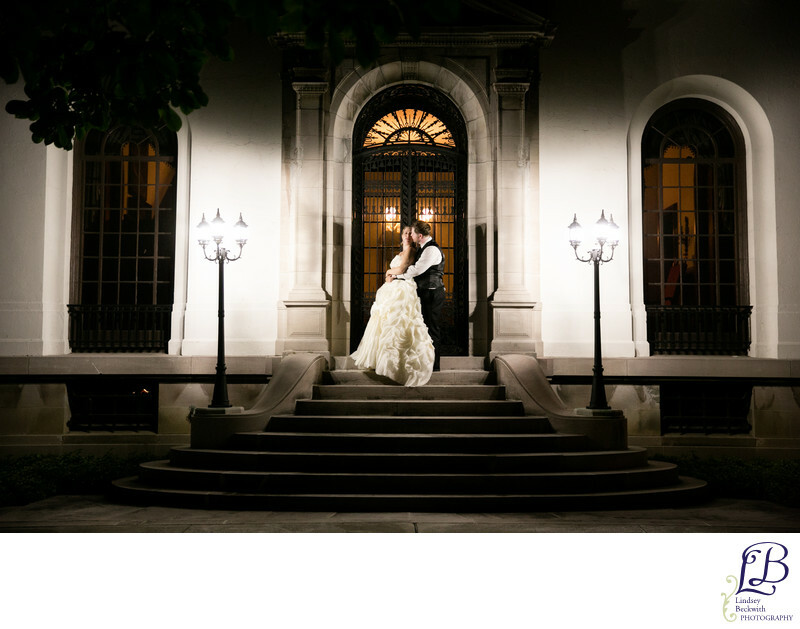 The Western Reserve Historical Society is a gorgeous and unique spot for a Cleveland wedding. This bride works in a museum, so it made absolute sense for her to get married in one of the cultural centers of Cleveland. We began the day in the bride's hotel room at Courtyard Cleveland University Circle. Surrounded by her bridesmaids, she slipped into the fluffiest, most beautiful, deconstructed ruffle dress I've ever seen. She completed the look with a black sash, and it was bridal perfection. All day, this bride and groom were adventurous and game for any location for photos. We did wedding photos near the red bridge on the Cuyahoga river, with the Cleveland city skyline in the background. Then back to the Western Reserve Historical Society for their wedding ceremony, and reception in the Crawford Auto Museum. I was so excited that the bride and groom were willing to step out of their reception for ten minutes to do this end of the night photo on the steps of the Western Reserve Historical Society. We hadn't planned to take photos here, but the symmetry of the doorway, combined with the light from the lamps drew my eye. Wedding ceremony photographed at Cleveland Western Reserve Historical Society. Wedding reception photographed at Crawford Auto Museum.